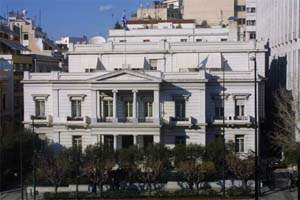 The central buildingThe Ministry of Foreign Affairs in Athens has its premises in seven buildings altogether, situated between Akadimias, Vasilissis Sofias, Panepistimiou, Kriezotou and Zalokosta Streets. 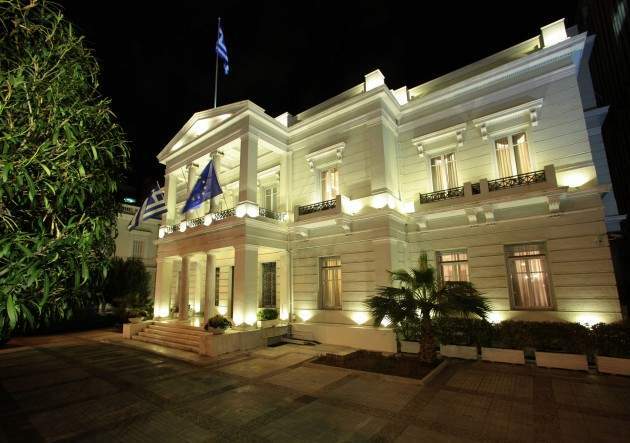 The central building of the Ministry, where the Minister's Office is located, is situated at the intersection of Vasilissis Sofias (former Kifissias Street) and Zalokosta. This building is also known as the Andreas Sygros Mansion, as it was his main residence during his lifetime. It stands opposite the north side of the Greek Parliament Building, which was the Royal Palace from the period of King Othon, until 1935. The central buildingThe central building of the Ministry, as mentioned already, stands at the intersection of Vasilissis Sofias Street (former Kifissias Street) and Zalokosta Street. 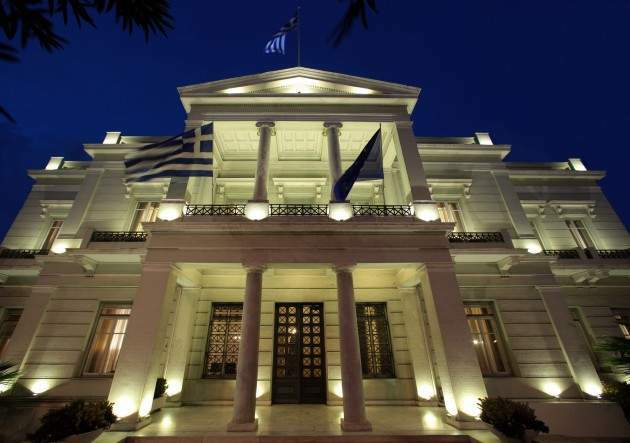 The Mansion was legated to the Ministry of Foreign Affairs by the exclusive heiress of the estate of Andreas Sygros, his wife Ifighenia Mavrokordatou - Sygrou, according to her secret will dated 31 /5/ 1921 and published by the Court of First Instance of Athens on 21 /6 / 1921. A copy of the will written by Ifighenia A. Sygrou was kindly conceded to us by the Institute of Agronomic Studies "Andreas Sygros". The secret will of Ifighenia Sygrou was hand-written by her lawyer, Mr. Thrasyvoulos Aghelopoulos, according to her own wish. After the death of Andreas Sygros, given the fact that he himself didn't have any children, his wife mentions in her will the following : "In Athens, today Monday, May 31, 1921, in my Athens house situated in Kifissias Street and present Konstantinou Diadochou Street, in which I reside permanently I, Ifighenia A. Sygrou, legate my residence in Athens, situaded in Kifissias Street and present Konstantinou Diadochou Street, with all its territory and all the buildings in it, to the Greek State, so that it can be used for good and all as part of the premises of the Ministry of Foreign Affairs". " I legate my well-known villa, Anavrita, situated between Kifissias Street and Amaroussiou Street with all its territory and all the buildings in it, the houses of the caretakers and of the workers, to the Geographical Society under the protection of His Majesty the King" Andreas Sygros, according to his hand-written will dated June the 9, 1897, bequeathed his residence to his exclusive heiress, Ifighenia, who was declared proprietor in virtue of the Decision N. 360 13 /2 /1899 of the Court of First Instance of Athens. Today the Mansion has a surface of 724 square meters, and a relatively recent (1985) connection with the other, more recent building, also of the Ministry of Foreign Affairs, situated at 2, Zalokosta Street. If we trace an imaginary line extending it up to Akadimias Street, the site of the building at 5, Vasilissis Sofias Street has a surface of 2,262 square meters, while the whole site, including all three buildings (5 Vasilissis Sofias Street, 2 Zalokosta Street and Akadimias Street), has a surface of 4,316 square meters. 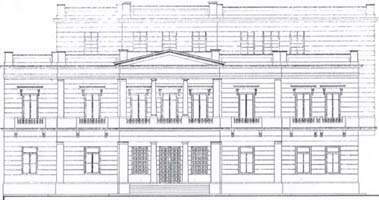 The exterior dimensions of the Mansion at ground floor level are 33.5 m. x 21.6 m. (Vasilissis Sofias Street and Zalokosta Street respectively) and includes ground floor, first floor, second floor and a terrace. According to the late owner and man who commissioned the building, the residence was built between 1872 and 1873, based on a design by the German architect Ernst Ziller. The whole mansion, the layout of which was modified during the building by the owner, Andreas Sygros, was built in two years, considered a very short period in those times. 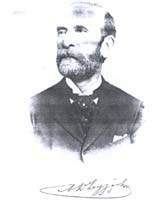 Supervisor of the construction work was Nikolaos Soutsos, engineer of the Army. Later on we will deal more with the situation of the urban planning of the area. It should be mentioned at this point that the Royal Palace of King Othon, based on a design by architect Friedrich Gaertner, was built between 1836-1842. As we can see in photographs of that period and particularly in an 1868 photograph published by professor Konstantinos Biris, before the building of the Andreas Sygros mansion, the site was occupied by a small building resembling a country house. On this site - which had an area of 5,000 ells and was sold to Andreas Sygros by the widow of Theodoros Ralis for 65,000 drachmas - one can distinguish through the high grass a two-storeyed country house with a triangular roof. Andreas Sygros arrived at Piraeus on 31/ 12/ 1871, having already rented the house of Dimitrios Soutsos in Athens, to use as a residence. "The family of Dimitrios Soutsos, to whom the house where I resided belonged, notified me indirectly that they were disposed to sell me the house. Nevertheless, I didn't want it to be my permanent residence. I desired to build a house to my own liking that would satisfy my own needs. Thus, I commissioned a friend to find me a building ground that would meet my criteria"
"It goes without saying that, with no exaggeration whatsoever, 2/3 of the present city of Athens was covered by building sites, all of which were offered to us at prices that seem ridiculously low today"
"...I chose the building site where my residence stands, in which I have lived until today. I bought this building site from the widow of Theodoros Rallis for the price of approximately 13 old drachmas per Greek ell..."
"Not wanting to regret my decision, I wrote to a friend of mine asking him to rent a house in Athens, with all the necessary furniture, on my account. 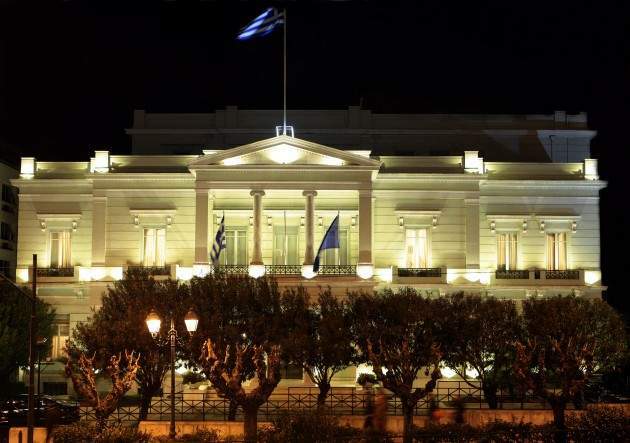 He then rented the Soutsos house, which today belongs to the politician Dimitrios Rallis, at Panepistimiou square, and sent me a list of all the kitchenware and furniture in it, so that I could complete it in London if I found that there was something missing. I found that there were many things missing and, consequently, I was taken by Alekos Ioannidis to one of those immense stores, of the few of its kind, selling house furniture, where one could find all kinds of house fittings, even coaches. It is not an exaggeration to say that in an hour I was already supplied with an entire household, perfectly decent, and had arranged for it to be sent to Athens"
"I was very impatient and couldn't wait for my departure for Athens, which I had to postpone in the end, because an epidemic of cholera broke out in Constantinople forcing the Greek government to impose quarantine on all travellers coming from Constantinople"
"I wrote to a friend of mine in Athens mentioning my decision and asked him to take measures so that I wouldn't have to undergo too much hardship during the days of my quarantine. He acted instantly and on the deserted island of Aghios Gheorghios, near Salamina, used for quarantines, he was given two ground floor rooms, which I rented from him. I immediately left for Piraeus, taking with me my cook, my valet and my coachman, as well as four horses and three coaches. It goes without saying that, men and animals, we were all obliged to stay in quarantine. (He arrived on December the 31, 1871)"
"...Before leaving Athens, I had agreed with Nikolaos Soutsos, engineer of the Army, who also undertook architectural work, that he would build me a house on the building site - on Kifissias Street, opposite the north side of the Royal Palace - that I had bought from the widow of Th. Ralis (approximately 5,000 ells for the price of 65,000 old drachmas)..."
"...Judging from the original design, by the architect Ernst Ziller, but modified by me (and that's why it is extremely inartistic), Soutsos calculated the budget of all the expenses of the construction, together with the stables and other outbuildings, to run to 125,000 drachmas..."
"After many adventures and two years of troubles, the building was over, with the expenses reaching 320,000 drachmas approximately. Working with Soutsos I spent 200,000 drachmas and the house was still incomplete, so its completion and interior design were undertaken by Piat, with whom I spent the rest of the amount. Of course, 1/3 of the whole expense was unnecessary. I wasn't in the least displeased with what had happened during the construction work. In fact, I was amused, well aware of the fact that when someone is absent while his house is being built, it is natural to note an exceeding of the estimated expenses"
"...Don't you value your own, personal work? Even though in my construction I spent 100,000 drachmas more than I would have had I supervised it by myself, I would have suffered the loss of the value of my own personal work, which I, at least, regard as being much more important than the amount of 100000 drachmas..."
"...That was indeed my way of thinking throughout my whole active life and I never regretted it, that is, I used to let other people profit, even at my expense, so that I could gain much more, working in the field of my own expertise..."
After some research, photographic material was gathered showing the area that interests us here. It also came to light that a large part of the Athenian area in question had belonged since 1929 to the National Defence Fund of the Ministry of War. The National Defence Fund proceeded to the Auctioning of that very part in 1940 and that way it came to be part of the property of the Joint Stock Fund of the Army. As an example we could mention that at the corner of Vasilissis Sofias Street and Akadimias Street was the Military Pharmaceutical Store, built in 1860 and used later as the main building of the Ministry of War. The new multi-storeyed building of the Ministry of Foreign Affairs, erected on the same site between 1973 and 1977, is the work of the architect Ioannis Vikelas. The Military Courts Building, a work of the architect Eugene Troumpe, stood at the intersection of Akadimias Street and Kriezotou Street and was demolished in 1969. 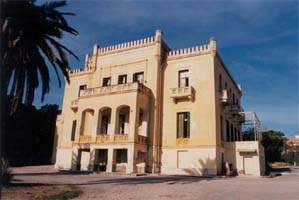 Further up Vasilissis Sofias Street, between Sekeri Street and Merlin Street, stood the Mansion which belonged to Irini Stournari-Merlin, probably designed by Dimitris Zezos in 1861. Erected at the intersection of Vas. Sofias Street and Zalokosta Street was the Psicha Mansion, where the Egyptian Embassy has its premises today. At the corner of Vasilissis Sofias and Irodotou Street, the architect Ernst Ziller erected the Othon Stathatos Mansion (1895). Greek independence, which was achieved at the beginning of the third decade of the 19th century, brought a radical change to the historical destiny of the country, but also irrevocably changed its social and political course towards a bourgeois progressivism. Neo-classicism is the style through which the artistic world expressed itself from the end of the 18th century until the first decades of the 19th century and was influenced by the idealistic school of philosophy, the revolutionary spirit and the noble ideals of the society of the time. In the Greek neo-classicism of the 19th century, researchers distinguish two currents known as "classicism" and "romanticism". Modern Greek architecture makes its appearance for the first time with the establishment of the monarchy and the reign of King Othon. On the one hand, the permanent presence in Greece of many Bavarian engineers and skilled workmen until 1843 was particularly significant and on the other hand, various other Europeans, especially Germans were invited to work . Professor Ioannis Travlos pointed out that European architects participated in the archaeological excavations of the Foreign Archaeological Schools in Greece, and that therefore their work is obviously influenced by classical monuments. The architecture of Ernst Ziller (1837-1923) is one of the most interesting amalgams of Athenian classicism and European romanticism. This combination created highly aesthetic buildings, which merged Greek classicism with elements of the Renaissance. Ernst Ziller managed to combine the Renaissance with Ancient times, with distinguishable eclectic tendencies, as first implemented by his teacher, Theophil Hansen, first introduced. Ziller constitutes a case apart. He was German, but took up permanent residence in Greece in 1861 and collaborated with Th. Hansen for the building of the Academy of Athens. Ziller took Greek citizenship, and through his participation in many activities (archaeological research, teaching in the Polytechnic, Public Works Administration) he left his mark on the Architecture of his time. The personal contribution of Ernst Ziller was the combination of Greek forms and decorative elements with the architecture of the Renaissance, in order to reflect the ideological needs of the Greek society of the time. Ernst Ziller succeeded in creating in Greece architectural works comparable to those that were being built in Vienna, as well as in the rest of Europe. The great distance in style that separated Schinkel's proposal (1834) regarding the Othonic Royal Palace on the Acropolis, from the Dimitriou Mansion (1842, later Grand Bretagne Hotel, entirely rebuilt in 1956) designed by Theophil Hansen remained inconceivable for the Greek thought of the time. Th. Hansen presents additional interest because of the Dimitriou Mansion, where, obviously influenced by Schinkel, he introduced a decor considered very unusual for his time. That was probably the first building with evident Renaissance elements in Athens. The arch-shaped porticoes towards the square, the ending of the roof with the decorative vases, the interior design, all these elements are an indication of the complete predominance of this architectural style in the future through the work of his disciple, Ernst Ziller. Othon, who, according to the Legislation of that period, had the right to authorise construction of new buildings in the square, was delighted with the designs and ordered that the same style to be used in all of the surrounding buildings. Given that we are in no position to know to what extent each architect participated in the erection of the Andreas Sygros Mansion, the research will cover the initial project of Ernst Ziller, as well as that of the other architects who supervised the works and introduced modifications to the original design made by Ernst Ziller, according to the desires of the owner, Andreas Sygros. Andreas SygrosWe proceeded to the investigation of the original design of this building according to the Memoirs of Andreas Sygros, in the Street still called Kifissias at that time, and to be exact, as Andreas Sygros himself mentions, opposite the north side of the Royal Palace of King Othon, where today the Greek Parliament has its premises. We can surmise the original form of the building from the photographs that have been published up to now. The oldest photograph of the Mansion, unfortunately dating only back to 1900, as well as the slightly more recent ones, shows us a two-storeyed building, with another small building on the terrace. An oblong, projected arched portico curved at the level of the entrance, runs across the side of Vasilissis Sofias Street. The arched portico stands on Ionic columns and is used as a balcony on the storey above. The front view is unadorned and structured in slightly projected pilasters with Ionic decorative elements. "About the sale of the former Ministry of War together with the buildings surrounding it to the Army Fund management". This Decree makes it possible for the Minister of War to sell to the Joint Stock Fund of the Army an area of 7,000 square meters, situated between Vasilissis Sofias, Akadimias, Kriezotou and Zalokosta Streets (in a crooked line). That was where the Ministry of War, the Military Courts and other Services of the Ministry of War were located. On the topographical map included in the Decree, the ground to be sold, the A. Sygros Mansion at the intersection of Vasilissis Sofias Street and Zalokosta Street, as well as a second building at 3 Zalokosta Street, are all clearly marked. Therefore, it is obvious that in this area there were two main buildings. That is what we conclude from his will, as well as from the will of Ifighenia A. Sygrou, where it is clearly stated: "I, Ifighenia A. Sygrou, legate my residence in Athens, situated in Kifissias Street and now Konstantinou Diadochou Street, in which I am residing permanently, with all its territory and all the buildings in it, to the Greek State, so that it can be used for good and all as part of the premises of the Ministry of Foreign Affairs"
The original design made by Ernst Ziller underwent many changes introduced either by Andreas Sygros, or - later - by the Ministry of Foreign Affairs. The original building is maintained as the nucleus of the present edifice. Extensions have been added on both sides of the building, resulting in a facade consisting of an arrangement of five parts. In the present building there is an added second floor, in a large recess, which belongs, however, to later modifications. The central openings of the front view towards Vasilissis Sofias Street have the same layout. The original trilateral front view, seen from Vasilissis Sofias Street, as well as the floor plan, consists of five parts. And this is the structural difference with the old edifice. With the addition of these lateral parts, the volumetric analysis of the front view changed and resulted in this exceptionally inartistic building. Andreas Sygros himself characterises his residence as inartistic after the modifications that he himself introduced to the construction, when the engineer of the Army Nikolaos Soutsos, "who also undertook architectural works", supervised the construction work. We have already mentioned that Piat is the engineer who undertook the interior design and the improvement of the Andreas Sygros residence. As we conclude from relevant bibliographical sources, extracts of which are mentioned in the footnotes, Piat worked in Athens during the last quarter of the 19th century, and his activity is some times mistaken for that of the engineer Eugene Troumpe. Piat was an engineer and introduced himself to Andreas Sygros, through some of his powerful French friends, as a brilliant and wealthy engineer, constructor of railways, and well connected with banking and financial institutions in Belgium. Besides, he is supported by the French Embassy of Athens, which asks him to carry out the construction of the building of the French Archaeological School on the corner of Didotou Street and Sina Street, based on a design by engineer Eugene Troupe. This information in given by Martin Schmidt in his article in the honorary Bulletin de Correspondence Hellenique published by the French Archaeological School of Athens in 1996 to commemorate the 150 years of its presence in Greece. The work for the construction of the French School started before the summer of 1872, while the building was concluded almost simultaneously with the Andreas Sygros residence. As Andreas Sygros quotes in his Memoirs " all matters concerning the construction of the railway were to be undertaken by Piat for a certain price Piat told me that he only needed my moral support with the Government, to which he was also wholeheartedly praised by the French Embassy"
Piat is also considered to be the constructor of the Skouloudi Mansion in Syntagma square (where the King George Hotel stands today), as well as of the Vouros Mansion (where the present Athens Plaza Hotel stands). Work on the building of these two edifices began simultaneously, in August 1873. As results form the photographic evidence, the building was radically modified after it was taken over by the Ministry of Foreign Affairs, possibly during the decade 1930-1940. Unfortunately, in spite of our research in the Archives mentioned in the sources of the present study, we were not able to discover the architects of these modifications. The most important change observed is the whole effort to give the building a more "classical" appearance. The whole atmosphere of the building, which originally looked like a mansion with its arched portico-terrace, was changed. The unadorned appearance was disturbed by the addition of a porch ending in a pediment on the first floor. The porch of the central entrance increased in height, took up the whole height of the building and was crowned by a triangular pediment. The decor was given a classical austerity and simplified Doric capitals crowned the columns of the porch on the ground floor, while on the first floor the capitals were Ionic. The parapet in which the roof ended still exists today in a form similar to that seen in the photographs of the time. The floor plan of the initial project of the mansion, designed by Ernst Ziller, is very similar to the ground floor of the present building, if we eliminate the two lateral parts added later. The floor plan made by Ernst Ziller has the shape of an inscribed Greek cross, an element also seen in the trilateral arrangement of the front side. Today the floor plan still maintains the characteristics of a layout around a central part in the shape of an inscribed cross. In both the Ernst Ziller floor plan and the present floor plan, the central stairs used for communication between the floors are situated at the same point, meaning that they occupy the back arm of the cross. In the National Art Gallery of Athens there is an Archive of Designs made by Ernst Ziller, and in particular watercolour number 131, named "A. Sygros Mansions". It is, of course, the floor plan and front view of the Andreas Sygros Mansion called "Anavrita", on the estate owned by Andreas Sygros. A comparison of the floor plan and the front view of the main residence of Andreas Sygros with the watercolours designed by Ernst Ziller for "Anavrita" reveals many similarities. Therefore, we come to suppose that the design of the mansion made by Ernst Ziller for Andreas Sygros was used as a model for both his city residence and his country residence.